Today, women have multiple treatment choices for breast cancer—from traditional surgery, chemotherapy and radiation therapy, to newer options in immunotherapy and targeted therapy. Yet, even conventional therapies are undergoing changes as researchers and clinicians investigate emerging technologies such as stereotactic body radiation therapy (SBRT). 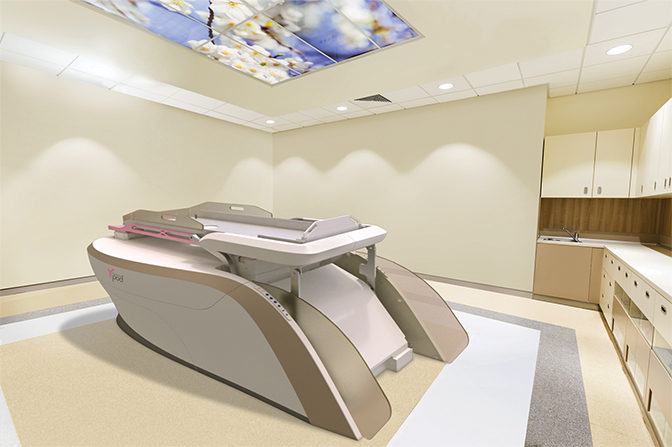 One of the largest SBRT practices in the United States is at NYU Winthrop Hospital in Mineola, New York, under the direction of Jonathan A. Haas, MD, chairman, Department of Radiation Oncology. In 2011, Dr. Haas launched a study, which obtained internal review board (IRB) approval, to evaluate the treatment of early stage breast cancer with SBRT. He collaborated with Sandra S. Vermeulen, MD, executive director of the Swedish Radiosurgery Center at Swedish Medical Center, Seattle, Washington, and together they treated 65 breast cancer patients with the CyberKnife (Accuray, Sunnyvale, California) (Figure 1). Dr. Haas presented their data at ASTRO 2017 in San Diego, and reported a 98% control rate at the 5-year follow-up. “That’s better than any other adjuvant treatment for breast cancer that’s out there,” he says, acknowledging that although one patient relapsed, it was in a different quadrant of her breast and possibly a different cancer. His treatment protocol in the study is based on accelerated partial breast irradiation (APBI) guidelines by the Radiation Therapy Oncology Group (RTOG). Patient eligibility and selection is a critical component, consisting of women with a tumor < 3 cm, margins negative by > 2 mm, a surgical cavity distance of 5 to 7 cm from the skin line, no positive lymph nodes, and exclusion of patients with invasive lobular carcinoma. In general, SBRT also is a more precise way to deliver radiation therapy, says Steven Feigenberg, MD, professor and vice chair of clinical research, and chief of thoracic radiation oncology at the Hospital of the University of Pennsylvania, Perelman Center for Advanced Medicine. In conventional radiation therapy planning, a margin of 5 to 10 mm is added to the target to account for intrafractional and interfractional setup uncertainties; however, SBRT typically can reduce those margins to 1 to 2 mm. Dr. Feigenberg explains that SBRT in the United States typically involves 1 to 5 treatments, depending on tumor size and proximity to surrounding normal tissues. While most breast SBRT is performed following surgery, a group at Duke University School of Medicine led by Janet K. Horton, MD, has examined preoperative single-fraction APBI in a phase 1 study.2 The authors reported that the therapy was well tolerated and should continue clinical trial testing as it may also enable identification of radiation response biomarkers. Currently, they are accruing patients in a phase II study. SBRT is also a treatment that patients want, says Elizabeth Nichols, MD, assistant professor of radiation oncology, and clinical director of the Department of Radiation Oncology, University of Maryland School of Medicine (UMSOM). In addition to decreased toxicity to surrounding tissue and enhanced patient convenience with fewer treatments, SBRT may be more cost-effective for a health system. A significant hurdle to providing SBRT for breast cancer is lack of reimbursement—a key reason Dr. Haas opened his study. As the data matures and SBRT is viewed as safe and effective for early stage breast cancer—as well as more convenient and potentially more cost-effective—he is hopeful insurers will initiate coverage. Dr. Nichols also notes that Medicare does not cover breast SBRT, due in part to a mismatch between what clinicians and insurers label as SBRT. “SBRT is a high dose per fraction, in just a few fractions, using image guidance with a very sharp dose gradient outside the tumor and in the surrounding tissue,” she explains. Since breast SBRT is new and evolving, insurers may not be aware of the treatment efficacy and patient outcomes data from recent and ongoing clinical studies. It would also be helpful for any type of SBRT procedure to have a real-time tumor tracking system, says Dr. Feigenberg. “A system that could do the tracking with a marker inside the tumor in real-time during treatment is the holy grail,” he says. While several techniques use surrogate markers and rely on surface imaging to monitor tumor movement, they are not 100%, he adds. Plus, placement of surrogate markers for image guidance can be difficult, says Dr. Haas. If these are inserted during a lumpectomy, the surgeon must place them in a way that facilitates their imaging. One of Dr. Haas’ radiation therapists, Lauren Boone, devised a method to place the markers during computed tomography (CT) simulation in a 10-minute outpatient procedure with no anesthesia. The procedure has worked remarkably well at NYU Winthrop, says Dr. Haas, who has taught it to other physicians. Although Dr. Haas has not yet conducted a clinical trial that escalates the dose— “It’s hard to argue with a 98% success rate,” he says—his department will participate in a study with UT Southwestern Medical Center and Asal Rahimi, MD, MS, director of clinical research, to examine single-fraction SBRT treatment intraoperatively. After lumpectomy, eligible patients will be enrolled to evaluate a single 20 to 30 Gy dose delivered to the surgical cavity. While Dr. Haas is admittedly not a fan of delivering treatment without knowing the final pathology, “the data supports it as effective, and we know it can be done safely in intraoperative therapy.” He adds that continued clinical studies of SBRT will likely examine further acceleration of the treatment regimen. In fact, Dr. Rahimi and colleagues recently published results of a phase 1 dose escalation trial for early stage breast cancer using 40 Gy in 5 fractions.3 The results demonstrated minimal toxicity and invasiveness, and excellent local control rates and cosmesis. “Between those two studies, we think something is there that requires further investigation,” Dr. Nichols says. “We can’t make the direct jump from SBRT to no surgery, so one of our clinical trials is to deliver ablative doses of radiation followed by surgery with the hope that we can see similar results.” The next step would be a trial examining SBRT without surgery. 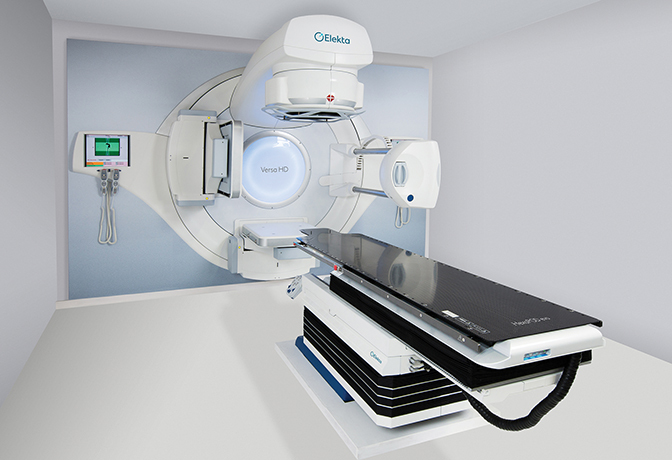 Several radiation therapy systems are available for breast SBRT. With the CyberKnife, the beam can be delivered from many different angles (noncoplanar treatment), minimizing dose to other parts of the body. “It is robotic and intelligent, with two imagers that track the movement of four fiducial markers placed around the cavity,” says Dr. Haas. It also has a respiratory tracking system using leads placed on the chest and stomach, enabling accuracy of < 1 mm in tracking movement. 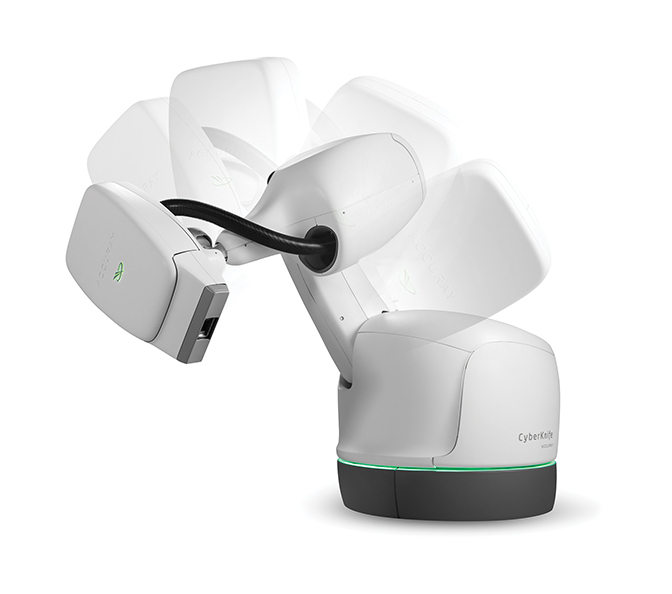 “CyberKnife remains the only robotic delivery system that detects submillimetric changes in the patient and target position, and automatically adjusts the aim of the linac to account for them throughout the treatment session,” says Fabienne Hirigoyenberry-Lanson, PhD, vice president of Accuray’s Global Medical and Scientific Affairs. “Coupled with by-design noncoplanar delivery of linac beams, the CyberKnife can deliver highly conformal beams with incredible accuracy.” The result of this accuracy has reduced margins and dose to surrounding normal tissue. The Versa HD system (Elekta, Stockholm, Sweden) (Figure 2) delivers highly conformal doses in hypofractionated settings in standard treatment slots and, according to John Christodouleas, MD, vice president of Elekta’s Medical Affairs and Clinical Research, offers advantages in mitigating motion-related inaccuracies and increasing patient comfort by lessening on-table time. “The large imaging and treatment field of view of Versa HD enables accurate and efficient treatment of more advanced indications where the lymphatic system needs to also be treated in addition to the primary target,” says Dr. Christodouleas. Versa HD is also integrated with the company’s Active Breathing Coordinator (ABC), which provides automated gating. This helps patients pause breathing at a specific tidal volume to maximize distance between the tumor and adjacent critical structures. Addressing the growing awareness for integrating MRI into radiation therapy, Elekta’s MR-linac, which is pending FDA approval, has the potential to address the movement of breast tissue as the patient breathes during the treatment cycle. Dr. Christodouleas explains that it integrates precision radiation dosing via a state-of-the-art linear accelerator with imaging from a high-field, 1.5T MRI without compromising either system. “It is the first system to achieve the technological feat of simultaneous radiation delivery and fast acquisition of high-quality, high-field MR images, providing the ability to ‘see what you treat’ during treatment and respond based on what is being seen,” Dr. Christodouleas adds. In addition to the potential to provide precise tumor targeting and real-time adaptive treatments that may improve margin and fraction regimens, the MR-linac may enable a reduction in both the field size for treatment of nodes and the size of the boost field for treating the primary tumor. Fresh off its clearance by the Food and Drug Administration (FDA) in December 2017, GammaPod (Xcision Medical Systems, Columbia, Maryland) (Figure 3) is designed specifically for SBRT treatments of the breast. Both Drs. Nichols and Feigenberg were involved in the clinical trial used in the FDA submission, as well as in evaluating dosimetric improvements of the device comparing APBI delivered by brachytherapy or intensity-modulated radiation therapy (IMRT).10,11 With GammaPod, they demonstrated a substantial decrease in dose to the skin, and less heterogeneity of dose compared to brachytherapy, theoretically increasing patient eligibility for noninvasive treatment with a better side effect profile. Unique to GammaPod is its noninvasive breast cup system that provides a secure immobilization to minimize motion during treatment and is imbedded with a fiducial wire for stereotactic target localization. Additionally, it delivers highly conformal dose distribution using dynamic dose painting. Patients are imaged and treated with identical 3D setup geometry, adds Rubenstein, and all treatments are performed in the prone position, which has been shown to limit dose to the heart and lungs. Xcision has established a consortium of academic institutions to lead the evidence development process, Rubenstein says. The group consists of the University of Maryland School of Medicine in Baltimore; UT Southwestern Medical Center in Dallas; Allegheny General Hospital in Pittsburgh; and The Ottawa Hospital in Ontario, Canada. Elekta’s MR-linac consortium of 12 centers features a research infrastructure in which physicians can develop a new breast SBRT paradigm that “adapts its target and total dose based on biologic responses assessed on quantitative MR sequences, such as diffusion-weighted imaging (DWI),” he adds. With advanced technology such as Versa HD, CyberKnife, GammaPod and the potential for real-time MR-guided treatments, along with numerous clinical studies delivering data to guide treatment decisions, SBRT is emerging as a promising option for breast cancer treatment. DeSantis IE, Ma J, Goding A, et al. Breast cancer statistics, 2017, racial disparity in mortality by state. Cancer J Clin. 2017;67(6)439-448. Horton JK, Blitzblau RC, Yoo S, et al. Preoperative single-fraction partial breast radiation therapy: a novel phase 1, dose-escalation protocol with radiation response biomarkers. Int J Radiat Oncol Biol Phys. 2015;92(4):846-855. Rahimi A, Thomas K, Spangler A, et al. Preliminary results of a phase 1 dose-escalation trial for early-stage breast cancer using 5-fraction stereotactic body radiation therapy for partial-breast irradiation. Int J Radiat Oncol Biol Phys. 2017;98(1):196-205. Nichols E, Kesmodel SB, Bellavance E, et al. Preoperative accelerated partial breast irradiation for early-stage breast cancer: preliminary results of a prospective, phase 2 trial. Int J Radiat Oncol Biol Phys. 2017;97(4):747-753. Charaghvandi RK, van Asselen B, Philippens ME, et al. Redefining radiotherapy for early-stage breast cancer with single dose ablative treatment: a study protocol. BMC Cancer. 2017;17(1):181. Vaidya JS, Wenz F, Bulsara M, et al. Risk-adapted targeted intraoperative radiotherapy versus whole-breast radiotherapy for breast cancer: 5-year results for local control and overall survival from the TARGIT-A randomised trial. Lancet. 2014;383(9917):603-613. Erratum in: Lancet. 2014 Feb 15;383(9917):602. Goodare H, Millington J, Pond P, et al. Late effects of breast radiotherapy. Lancet. 2014;383(9917):602. Dutta SW, Showalter SL, Showalter TN, et al. Intraoperative radiation therapy for breast cancer patients: current perspectives. Breast Cancer (Dove Med Press). 2017;9:257-263. Snider JW 3rd, Mutaf Y, Nichols E, et al. Dosimetric improvements with a novel breast stereotactic radiotherapy device for delivery of preoperative partial-breast irradiation. Oncology. 2017;92:21-30. Snider JW 3rd, Mutaf Y, Nichols E, et al. Projected improvements in accelerated partial breast irradiation using a novel breast stereotactic radiotherapy device: a dosimetric analysis. Technol Cancer Res Treat. 2017;16(6):1031-1037. Massat MB. Stereotactic body radiation therapy for breast cancer: Benefits, challenges and choices. Appl Rad Oncol. 2018;7(1):50-54.